(Asheboro,NC) Tim Brown earned his first victory in nearly a year, and his first ever win at Caraway Speedway by leading the final 26 laps Saturday night, to capture the Whelen Southern Modified Tour 150 at Caraway Speedway. Brian Loftin (No. 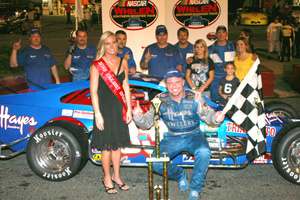 23 L&R Transmission/QMF Solutions Chevrolet) finished second and increased his points lead when his closest challenger L.W. Miller finished 18th. Loftin leads Miller by 79 points and Brown by 87. Brown (No. 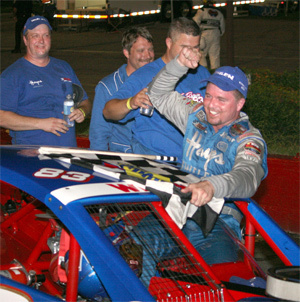 83 Hayes Jewelers/Triad Auto Sales Chevrolet) qualified sixth and started third after the post-qualifying redraw. Miller qualified third, redrew the top spot, and led the first 66 laps before being slowed by a flat tire and penalty. Brandon Ward took over the lead on lap 67 and led until Brown passed him. It was Brown's fourth career win and first since Sept. 15, 2007. Following Loftin, Andy Seuss, Frank Fleming and Brian King rounded out the top five. 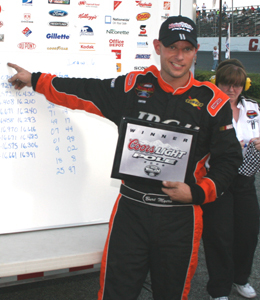 Earlier in the day, Burt Myers earned his third Coors Light Pole Award of the season and tour-record 16th overall. 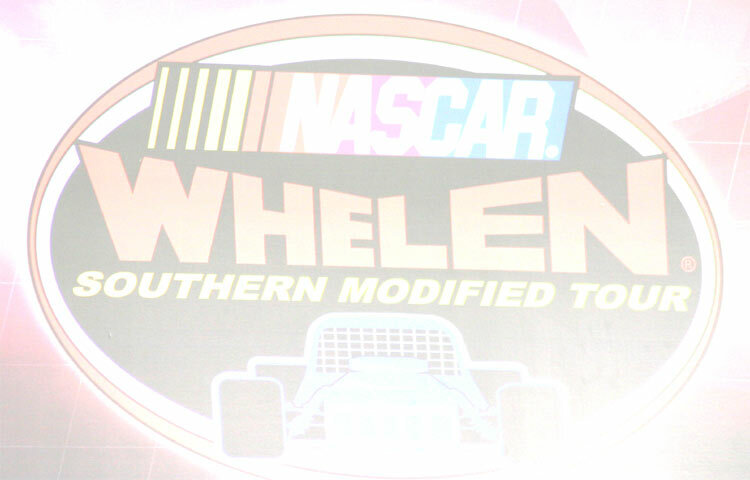 NASCAR Whelen Southern Modified Tours next stop Southern National on September 13th.This event is a make-up from earlier in the season when it was rained out. Caution Flags: 5 for 22 laps. Lap Leaders: L.Miller 1-66; B.Ward 67-124; T.Brown 125-150. Standings: 1. B.Loftin, 1147; 2. L.Miller, 1068; 3. T.Brown, 1060; 4. B.Myers, 1048; 5. F.Fleming, 992; 6. J.Myers, 990; 7. B.King, 990; 8. A.Seuss, 971; 9. G.Brunnhoelzl, 905; 10. B.Hire, 879.